This town was anciently called Werlamcester, or Watlingacester, the former name being derived from the river Warlame, which ran on the east side; the latter, from the Roman highway called Watling-street, which lay to the west. (Mat. Westm. Flor. Hist. ann. 513.) Tacitus calls it Verulamium; and Ptolemy, Urolium. The situation of this place was close by the town of St. Alban’s, in Hertfordshire. There is nothing now remaining of old Verulam but ruins of walls, chequered pavements, and Roman coins, which are often dug up. It is conjectured, from the situation, that this was the town of Cassivelaunus, so well defended by woods and marshes, which was taken by Cæsar. In Nero’s time it was esteemed a immicipium, or a town whose inhabitants enjoyed the rights and privileges of Roman citizens, It was entirely ruined by the Britons, during the war between the Romans and Boadicea, queen of the Iceni. Afr terwards Verulam nourished again, and became a city of great note. About the middle of the fifth century, it fell into the hands of the Saxons; but Uther Pendragon, the Briton, recovered it with much difficulty, after a very long siege. After his death, Verulam fell again into the hands of the Saxons; but by frequent wars, it was at last entirely ruined. 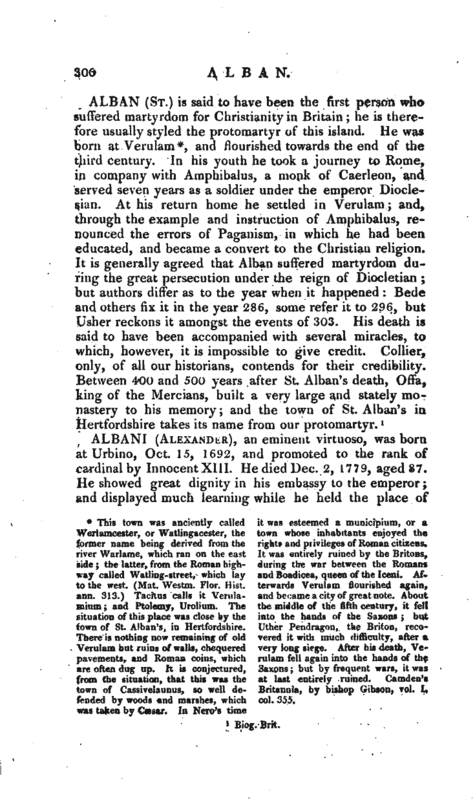 Camden’s Britannia, by bishop Gibson, vol, tI col. 355.